In April 2016 Allnamics has performed PDA-monitoring and DLT-testing for our client Voorbij Funderingstechniek BV, for the Amstel Towers Hotel near Amstel station in Amsterdam. 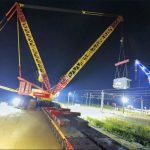 The tests were performed on 51 m long precast concrete piles, driven in sections, with a mechanical joint. PDA monitoring (Pile Driving Analysis) was performed during full installation cycles of selected production piles. Main objective of the test was to check the tensile stresses during driving, in particular at the location of the mechanical joint. DLT-monitoring (Dynamic Load Testing) was performed during restrike (approx 10 blows) on piles that had been installed a couple of days earlier. Main objectives of this test were to check the strength of pile shaft and joint and the static bearing capacity of the pile. 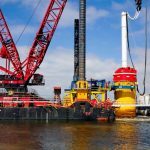 Both tests were performed with the in-house developed Allnamics PDR-system, fitted with combined strain and acceleration sensors, which were mounted near the pile head. The PDR records and stores the monitoring data and transmits them real-time with a wireless connection (by WiFi) to the field computer of the monitoring engineer. The wireless connection offers great advantages during upending and positioning of the pile and makes it possible for the monitoring engineer to do his monitoring job on a good location, at a safe distance from the pile and without traditional worries about the long cable getting stuck or damaged during handling or piling.